Oil your bike chain, adjust the axle nuts on your skateboard, charge your Segway or electric scooter and/or change the shoestrings in your sneakers. 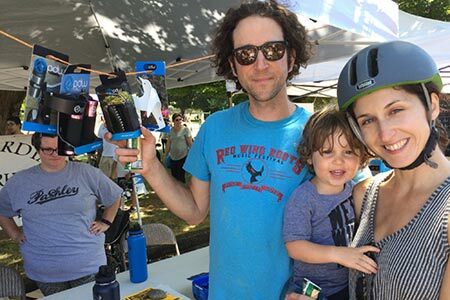 Sundays Parkways comes to northeast Portland Sunday, Sept. 23. Street closures and vendor booths in the parks from 11 a.m. to 4 p.m. provide a safe walk or ride for people of all ages. There are eight miles of streets closed to vehicular traffic for you to wend your way through neighborhoods and parks in Concordia and nearby neighborhoods. The route is largely on Ainsworth and Going streets, connected by 9th and 55th avenues. Visit PortlandOregon.gov/ transportation/article/676060 for the map that designates all of the roadways and the four parks. Woodlawn, Alberta and Fernhill parks offer activities, music and food. At Khunamokwst Park is a Bilingual Bike Fair sponsored by the Portland Bureau of Transportation (PBOT) and the Andando en Bicicletas en Cully Group. That bike fair offers bike safety information for young and forever young cyclists. This is the final of five Sundays Parkways in this, the PBOT event’s 11th year. Total attendance in the first decade’s 44 Sundays Parkways events is estimated at nearly 900,000 people. This is the first year PBOT has worked with Olde World Puppet Theatre to showcase as many as 66 tall and small puppets through an exhibit with themes that range from mermaids and birds to giants and sharks.